Popular “Trails and Ales” hiking program. Photo Credit: Richard Murphy. The popular “Trails and Ales” program has returned to San Diego, with nature lovers and craft beer enthusiasts reunited in this 4-month hiking series, according to the San Dieguito River Valley Conservation (SDRVC). This North County hike series offers a unique hike with experienced tour guides overseeing the nature exploration, said a manager from SDRVC. 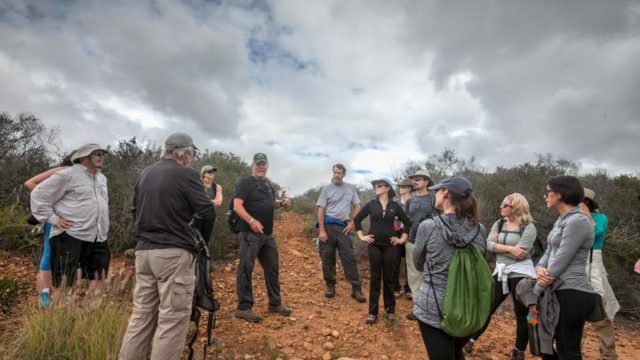 The hike organizers include the San Dieguito River Valley Conservancy, San Elijo Lagoon Conservancy, Escondido Creek Conservancy and the Volcan Mountain Foundation. Every hike ends with a fun, relaxing trip to one of San Diego’s local breweries. Mark your calendars for Sept. 3, Oct. 1, Nov. 5 and Dec. 3. All the hikes start at 10 a.m., with guidance from local, seasoned wildlife educators, according to the SDRVC. The SDRVC says each hike has limited space, capping the number of participants at 25 people. In order to join, hikers must be age 21 or older. Registration fees are $25 per a hike for non-members and $15 for members. A special deal is available to new members, who can pay only $75 to receive an annual membership to the organization of their choice and register for the entire 4-hike series, according to the SDRVC. The first hike begins at Piedras Pintades, set for Sept. 3. The SDRVC says it’s considered an “easy,” beginner friendly hike consisting of 3.8 miles. This will be followed by a visit to Second Chance Beer Company in Rancho Bernardo, where hikers can enjoy a flight of tasters. On Oct. 1, fitness buffs, nature lovers and brewery enthusiasts will tackle the Volcan Mountain, an “easy-to-moderate” 2-mile roundtrip trail. According to the SDRVC, this trek will involve walking behind the scenes on Volcan Rd. and Volcan’s Sky Island Trail. Both of these areas are not usually open or accessible to the public. The journey will be topped off with a trip to Julian Hard Cider where hikers can taste a flight of three fresh-pressed hard ciders. Next, on Nov. 5, hikers will persevere through a 3-mile “moderate-to-strenuous” journey, set on Annie’s Canyon Trail. This will entail moving through a wild stretch of the San Elijo Lagoon Ecological Reserve, according to the SDRVC. Of course, the day would not be complete without a visit to The Lost Abbey’s tasting room in Cardiff. Finally, on Dec. 3 the adventurers will hike the “intermediate-and-uphill” 2-mile Bottle Peak Trail, and celebrate their journey with a visit to the Offbeat Brewing company in Escondido, according to the SDRVC. For more information on the “Trails and Ales” hiking program and how to register, visit their website here.